When listening to unfamiliar romantic or late romantic music, such as the two symphonies by the Swiss composer Robert Hermann (1869-1912), it is easy to pull out a mental scorecard: Schumann and Brahms and perhaps Dvorak are obvious influences – or at least Bruch or Reinecke. Or perhaps the music owes more to Wagner and even Bruckner. There is even a possibility that the music is inspired by a French tradition, Franck or even Chausson. Well, it turns out that there isn't a trace of any of the composers mentioned in Robert Hermann’s music. There isn’t even really any trace of Beethoven! 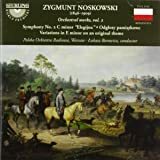 (unless one imagines a distant kinship with the sixth symphony, but I think that is more a matter of shared atmosphere). That’s not to say that there are no influences at all to be discerned here: I certainly hear a bit of Raff (indeed, listening to Hermann and the traces of Raff in the music has made me appreciate more than before that Raff’s musical language was more original than it is usually credited for), maybe a touch of Liszt’s orchestral music (though that might be mostly due to what it owes to Raff – yes, it does) as well as Hermann’s teacher Humperdinck. Finally, there are some hints of contemporaneous Italian opera (pre-verismo) in the melodic material. But yes, Robert Hermann’s sound world is actually pretty original. That’s not to say that this release is going to change music history or that these two symphonies quite manage qualify as timeless masterpieces. Indeed, these sunny, easy and generally cheerful works do not appear to have any such pretentions. But they are, indeed, not quite like anything you have heard before. The sound world actually reminded me more than anything of the sound world of Darius Milhaud’s symphonies (no less) – no, they aren’t exactly peppered with bitonality (there are traces, though), but they have, if nothing else, the same kind of occasionally slightly raucous pastoral character: “Somewhere between Raff’s and Milhaud’s symphonies” is probably the closest I can come to describing the gestalt impression of the music, which is also infused with at least traces of Swiss folk music. The first symphony (from 1895) is what one would associate with the epithet “pastoral symphony”. It flows easily like a summer river, never too slowly but always warmly atmospheric: grazing sheep, blue sky, green fields and birdsong. The subtle shift in moods between the movements is nicely done (it is all gentle and pastoral, but in different flavors). But although the work is optimistic and happy and almost entirely without dramatic conflict, it is not in any sense superficial (especially the central movement carries a weight that is rather striking), and even at 36 minutes it does not feel a moment too long – although not particularly fast, the music flows so naturally and gracefully that it almost seems to pass by too quickly. The second symphony, from 1905, is a tad fiercer – strength, heroism and resilience, perhaps, in addition to the optimism. The style and sound world is really pretty much the same as in the first symphony, though there are some darker clouds in the sky here. Like its predecessor this symphony is captivatingly atmospheric and flows with such inevitability that it easily keeps the listener’s attention throughout: It’s really the kind of music where one feels that the composer could go just keep on spinning the ideas further almost forever without losing the listener’s interest – even when those ideas are themselves not necessarily particularly striking. The performances by the Württembergische Philharmonie Reutlingen under Christopher Fifield are overall very good. Yes, one could imagine a touch more opulence and color in the strings, and slightly warmer winds, but really: That’s probably not going to happen anytime soon, and these performances are way, way above the merely serviceable. The sound, too, is decently balanced if a bit dry. In sum: Very good if not perfect performances of truly compelling and original music – no, they may not ultimately be timeless masterpieces, but really: If you like late romantic music in general, this is something of a change from the usual pace: You really won’t have heard anything that sounds quite like the symphonies of Robert Hermann before. So despite some caveats, I think I can defend a top rating for this release – especially since the other reviewer gave it four stars, which feels a bit stingy. And Sterling should be praised for the effort. These are not GREAT but they are pretty damned GOOD. Music snobs can pick at them for this or that but that comes with the territorial music snobbery. They are "nice". They are enjoyable listening. 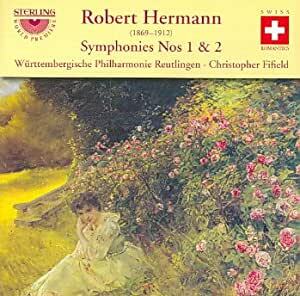 Hermann's writing DOES seem to wander a bit and maybe it could be thought of as "classical easy listening". But hey, not all classical is furrow browed serious. This may be even be thought of as "lumbering nice" at times. They are worth the money to me. They are good enough that a group of people invested their time and effort in bringing the recorded music to a disc. They are good enough that a group of fine musicians gave it their all I think in playing these symphonies. I am pleased with the addition of these little gems to my music collection. Two skillfully crafted symphonies by a composer who deserves to be better known. The melodic content is of a high level, and the harmonies both subtle and creative. Sterling has made quite a discovery here.